I've been pleasantly surprised with my lack of exposure to Total Quarterback Rating, ESPN's proprietary formula for measuring QB that's supposed to be more accurate, or at least more complete, than passer rating. After the preseason blitz, I absolutely expected it to be shoved down my throat. But it's been limited to the occasional SportsCenter and MNF graphic, and is tucked away on ESPN.com where I can take a look any time I want. The way a stat should be. I'll unignore the Total QBR long enough to point out that I have found justification for ignoring it: Under the Total QBR, Tim Tebow performed better on Sunday than Aaron Rodgers. Rodgers, whose Packers won at the Georgia Dome, completed 26 of 39 passes for 396 yards and two touchdowns. His Total QBR was 82.1. 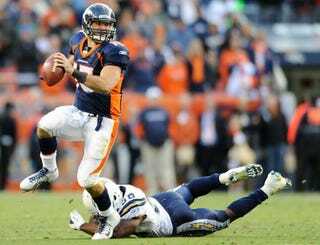 Tebow, whose Broncos lost at home to the Chargers, completed four of 10 passes for 79 yards and a touchdown. And he ran the ball six times for 38 yards and a touchdown. And his Total QBR was 83.2. Two things wrong here. First, the emphasis on team result is akin to a writer claiming wins are the truest measure of a pitcher's value to his team. Second, the listing of yards gained, points scored, passes completed is an insistence on quantity, which has no place here. Total QBR is a measure of efficiency, and has never claimed to be otherwise. Tebow, with his two scores in just a single half of play, is naturally going to be rewarded due to his smaller sample size. Does Florio complain that Colin Kaepernick has a 100 percent completion percentage because he's 3-for-3? Just looking at the stat breakdown, it's not hard to see where the scores come from. Tebow outgained Rodgers on the ground. Tebow didn't take a sack, while Rodgers was brought down four times. Rodgers cost his team with penalties, while Tebow didn't. And most importantly, Tebow averaged much worse starting field position: in QBR's emphasis on Expected Points Added, Tebow did more with less. What QBR is: a statistical formula, open to legitimate criticism and mechanical tweaking, that attempts to qualify and normalize a quarterback's performance over a certain period of time. What QBR is not: an ESPN headline saying that Green Bay wishes it had Tim Tebow starting.